North Africa’s Mediterranean coast, or the Maghreb, has always been a place where cultures collided and nowhere is this more evident than in the diverse cuisines of the countries in the area. It can be difficult to generalise about these cuisines because although they often use similar combinations of ingredients each region has developed its own particular techniques and customs. Historically, the cooking of this region has been influenced by the cuisines of many different cultures including Bedouin, Berber, Arab, Jewish, Persian, Turkish and Moorish as well as those of European countries such as France, Spain and Italy. Couscous (or kuskus) is the staple grain of the region and is served in one form or another with almost every dish. Steamed or soaked, served hot or cold and mixed with any variety of meat, vegetables, herbs and spices, it is the local equivalent to rice or pasta. North African cuisines also make extensive use of slow cooking. Dishes such as the Moroccan tagine – the name of both the dish and the vessel it is traditionally cooked in – are usually left to stew overnight at a low heat to allow flavours to fully develop while keeping meat and vegetables tender. It is worth noting that Tunisian cuisine has a dish called tajine that is completely different to the Moroccan version, being more like a quiche. The closest equivalent to a Moroccan tagine in Tunisian cooking is called a coucha. Lamb is the main meat used for dishes due to religious strictures although the Mediterranean Sea also provides bountiful fish. Most of the vegetables used are familiar from other Mediterranean cuisines although North African recipes tend to make much greater use of aubergine and courgette than their neighbours across the water. 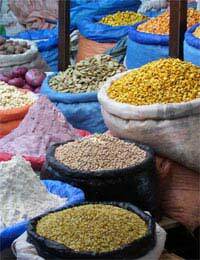 Carrots and peppers also feature heavily as do many pulses such as chickpeas and lentils and grains including millet and the aforementioned couscous. Dried fruits, particularly apricots and dates also feature in many North African recipes. Preserved lemon is a particular regional speciality, prepared in a solution of salt and lemon juice, which can add a zingy citrus kick to any dish. As with many cuisines that share common ingredients, it is the use of spices that differentiate North African cuisines from each other and from other local cooking styles. In general terms, Tunisian food is fierier, Moroccan food is richly flavoured and Libyan food tends towards the comparatively simple ‘tent cooking’ but is all the more delicious and healthy for that. Access to the merchants of the Kasbah and their bright mountain ranges of freshly ground spices has produced cuisines wise in the ways of combining aromatic and earthy flavours to best effect in any dish. No North African kitchen would be complete without harissa, a paste based on garlic and chillies and including a mixture of spices and often tomatoes. In many North African cuisines it is used simply as a condiment but in heat-loving Tunisia it is a common ingredient in many dishes. Other regular features of North African food include tahini, a sesame seed paste used in babaganoush (similar to hummus but made with roast aubergines instead of chickpeas for a fuller flavour and smoother texture) and za’atar, a dry mixture of spices and seasonings used as a rub for meat or fish dishes. The desserts that come from the region bear some similarity to those of Turkish cuisine but are also very distinctive. Usually they consist of pastry with nuts and almonds and sweetened with honey. They often make use of dried fruit, such as figs or raisins, and mild spices, particularly cinnamon.